Frederick Selous was a world famous hunter and explorer in Africa during the 19th Century. His exploits were the source for the fictional character Allan Quatermain in the H. Rider Haggard books. He was part of the Rhodes Pioneer column into Matabeleland in 1890, working as a guide as he knew the area well. He settled in Matabeleland following the war of 1893, and was part of the settler resistance to the Matabele rebellion in 1896. His memoir of the Rebellion is an excellent eye-witness account of the war. The Selous pack comes as a mounted and dismounted set. 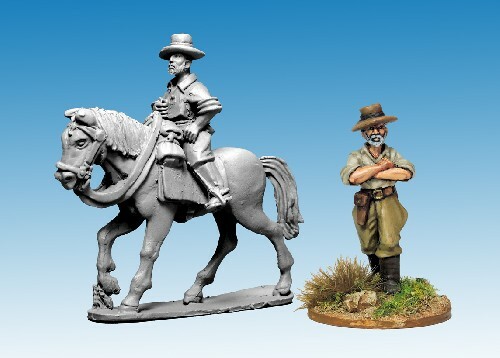 North Star Africa are 28mm sized, made of metal and supplied unpainted.